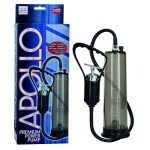 Apollo Premium Power Pump Smoke from California Exotic Novelties. Harder, stronger, longer. Apollo is the new standard! The American Pumpers Association. 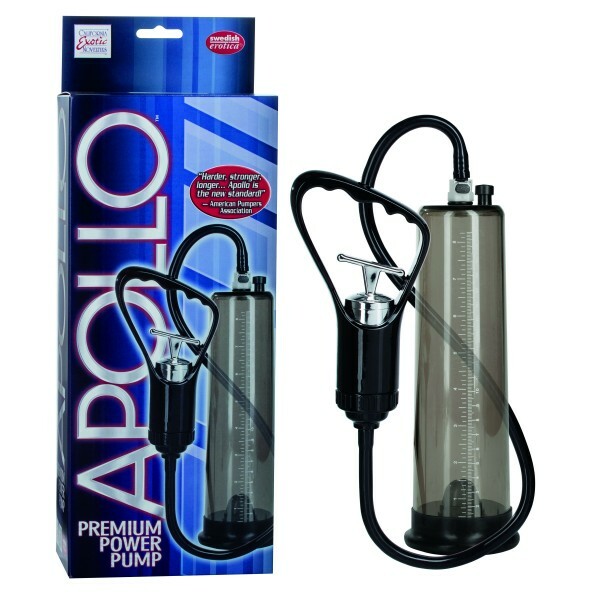 Removable air hose easily detaches while maintaining suction. 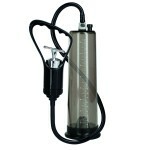 Professional grade vacuum pump with easy squeeze trigger handle. Heavy-duty over sized seamless cylinder with flanged base and universal measurements. Flexible non-crimping hose with quick disconnect. Silicone donut. Quick release valve. Safe and pure for body and pleasure made using phthalate free, non-toxic materials PS cylinder, ABS plastic handle, ABS plastic with silver plating trigger, Silicone donut, PVC hose, POM connector, Ferric connector release. 9.5 inches by 3.25 inches. Bulk weight 13.1 ounces. Category: For Men, Pumps, Non-Vibrating.